My name is Gary and I graduated from the Oxford Seminars’ TESOL/TESL Certification Course with my sights set on traveling to Korea. I now work at a reputable language institute, teaching adults, in the city of Daegu. The school treats me quite well and the other teachers and staff are very happy. The adult students I teach are eager to learn the English language. They love the slang, expressions, and normal everyday language. I teach early in the mornings and evenings to accommodate their university and work schedules. Many of my students are working professionals, from project managers to doctors and dentists. My students are a fun group and have shown me much gratitude. Houseware items and complimentary meals are just some of the things I have received from my students. In a short time, I have met many Koreans and foreigners at my school. Many of the teachers come from places such as New Zealand, Australia, the US, and Canada. The people I’ve met have been very helpful in making my adjustment to Korea an easy one. 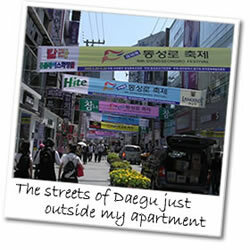 I live in downtown Daegu, about a ten-minute walk away from my school, and just steps away from the downtown subway. 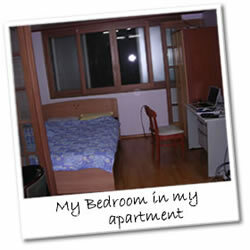 My apartment is quite big and clean; in fact it is the largest one amongst the teachers at my school. My school has made sure that my living situation is good – they even had the walls and floors redone before I arrived. 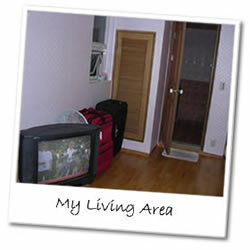 Traveling within Korea is very easy and can be done economically. There are many buses and trains that run each day. The high-speed train is the best way to travel and is fairly inexpensive. The food here is very good and reasonably priced. Most meals can be had for about $5 and tipping is not required. I have sampled a lot of the Korean food; my favourite is Bak-Galbi (chicken fried rice in spicy Korean sauce) and I eat it on a regular basis. 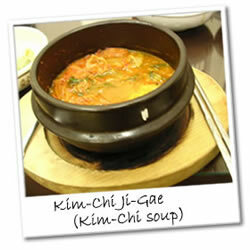 Kim-Chi Ji-Gae (Kim-Chi soup) is also good when you are craving something hot. There are also many Western restaurants including: McDonalds, Outback’s, Subway, and Dunkin’ Donuts. As for entertainment, there are many theatres featuring American movies, billiards, and bowling alleys. I have to admit that picking up and leaving the comforts of home was not an easy thing to do. I had many questions and worries before going like: How can I teach these people, Will I like it?, Will I make any friends? It is okay if you are asking yourself the same questions. It is a difficult decision to go thousands of miles away to a foreign country and the language barrier and culture can be challenging. I have absolutely no regrets in coming here and I haven’t even been too homesick since my arrival. It has been an exciting adventure and I highly recommend teaching abroad! Oxford Seminars prepared me practically and mentally for the challenges of going overseas. The teaching practicum component of the course was a good experience and I gained much insight from my instructor who had taught in Japan. If you are looking for change, a challenge, and a great experience, then take the chance to travel and teach abroad. I have experienced so much in a short time and I look forward to the opportunities and challenges that await me.